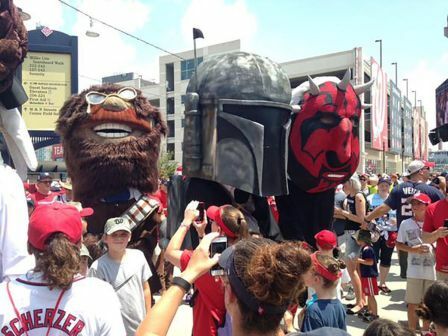 By Martin Morse Wooster: Good sense and prudence should have stopped me from going to Star Wars Day at Nationals Park on July 19. The game time temperature began in the mid-nineties and hit a high of 98. It was hotter than a dragstrip on Tattooine, and we Baby Boomers don’t do well baking in the sun. But the Nats were giving away R2-D2 can coolers, sponsored by ThinkGeek. What you got was a can — but it was a Star Wars can! And the carton had stormtroopers on it! Plus the matchup that afternoon was quite good. The Nationals had their ace, Cy Young winner Max Scherzer, who threw a one-hitter and then followed it with a no-hitter. The Dodgers were sending Zach Greinke, a Cy Young winner who was working on the longest streak of scoreless innings since Orel Hershiser in 1988. Put together Cy Young winners and science fiction, and you get an afternoon of Cy-Fi. The event was a sellout. Here’s how popular it was. Two weeks ago I went to a Sunday night game against the Giants and StubHub sold me a pretty good seat in the right-field upper deck for $14, which included a Stephen Strasburg bobblehead. For Star Wars Day, I got a less good right field upper deck seat for $40. I saw very few fans — probably less than five — wearing any sort of Star Wars outfit. (Star Wars t-shirts don’t count.) According to the Washington Post’s Dan Steinberg, most of the hard-core costumers spent their game in the air-conditioned bar. I didn’t see them. Boba Fett Hot Dogs. Planet Hoth Shaved Ice. Cloud City Cotton Candy. Luke Frywalker Cheese Fries. Semipro members of the 501st Legion were in tents, if you wanted to stand in a long line to have your photo taken with a stormtrooper. The Nationals players appeared on the Jumbotron dressed as Jedi Knights. The Dodgers were stormtroopers. The Nationals’ Fan of the Game contest is a dance off which is always won by a little kid with ADD. The winning kid yesterday wore a giant Darth Vader mask. The race yesterday was a relay race, and the climax featured George Washington as Darth Maul versus Calvin Coolidge, whose hideous yellow wig led MLB writer Ben Cosman to think of “that guy from Spinal Tap.” It turned out Coolidge was playing Luke Skywalker. At the climax, Luke and Maul fought it out with lightsabers and Darth Maul won. “Non-canonical!” hissed a gentleman behind me. I didn’t know if anything I saw yesterday was canonical. One thing the Nationals only used once was a sign looking like the opening title to Star Wars, replacing, “Let’s Go, Nats!” with “Use the Force!” The Force was not with the Nationals yesterday, as Zach Greinke three-hit the Nationals through eight innings. I mentally added Greinke to the list of great pitchers I’ve seen (Seaver, Sutton, Ryan, Maddux, Johnson, topped by Jordan Zimmermann’s no-hitter). So it was a good day, and if I get tired of staring out the window at work I can always stare at my R2-D2 Can Cooler. But boy, was it hot! This entry was posted in Skiffy and tagged Martin Morse Wooster, Star Wars by Mike Glyer. Bookmark the permalink. Not all of the Nationals were dressed as Jedi for the Jumbotron; Danny Espinosa was in a Han Solo outfit, and someone else was in a Boba Fett one, and another looked like an X-wing pilot. I enjoyed the Presidents Race, I just wish Darth Maul hadn’t won! Booo! I don’t blame any cosplayers for staying in the bar–it was in the high 90s, and my wife and I could barely stand the heat. We went to our apartment’s pool afterwards. Joni and I went down, since as Martin notes it was Star Wars Day, along with the weekend before my birthday. We were in the upper deck at third base. We got there early to make sure we got one of the can coolers, and the stands were so hot by 12:30 that we waited in the concourse the rest of the time until the game started. Lots of Star Wars related activities; other than what Martin posted, there were trivia contests, an R2-D2 building contest and an area to take photos against a backdrop of the Millennium Falcon bridge. We had to leave after the seventh inning in order to get back to our hotel and make the drive back to Philadelphia, but it was a great pitchers’ duel until the Nats had to pull Scherzer once his pitch count got close to 100. After that their bullpen gave away the game.